Catch up with current projects, new ventures and see some very bad puns (Editor: bad metaphor) via Z/Yen's blog or the eagerly awaited newsletter. Security Forward-Risk and Intelligence Forum's quarterly meeting was held on 11 July at The Guoman Tower Hotel with an unparalleled view overlooking London's iconic Tower Bridge. Our first speaker was our own 'Speaker in Residence' and Senior Adviser, Lt Col Crispin Black MBE MPhil, who spoke about the various implications artificial intelligence may bring with its emergence into the world. The presentation titled "Artificial Intelligence: Miracle or Monster?" was incredibly thought-provoking right from the start with philosophical questions such as “what is consciousness?” and “what constitutes intelligence?” Crispin then touched on the computational failure of the algorithm named 'Ada' which Hillary Clinton’s campaign was heavily influenced by and reliant upon. The algorithm ran thousands of daily simulations to see what possible outcomes might have arisen in the United States Presidential election, but clearly this complex analytical algorithm still couldn’t account for the actions of rural voters. Crispin then dove deeper into the field of artificial intelligence by giving examples of supervised learning, unsupervised learning and the differences between them. Crispin also spoke of the triumphs of artificial intelligence such as AlphaGo conquering over 18-time world champion Lee Se-dol in the abstract strategy board game ‘Go’. The conversation then turned more towards the ethical implications of artificial intelligence once it becomes entangled with robotics. Crispin raised skepticism over the implementation of autonomous cars, but then delivered some key points as to why artificial intelligence may be better suited for aircraft, especially in times of emergency where human decision making may not be quick enough. Crispin also noted the ethical implications of artificial intelligence which was debated heavily by the entire forum and led us into our coffee break. Our second speaker was Phil Cracknell from GCA Security, who is widely regarded as one of the top information security specialists in Europe. Phil gave a fascinating and informed presentation entitled “CISO’s need to speak the language of the Board” which highlighted the need to understand how to couch presentations to the Board in language that addressed the concerns of the Board. In many corporations there seems to be a disconnect between the Board, who see things from a strategic and risk perspective and the financial implications that that brings with it, as opposed to some CISO’s who focus more on technical issues and the cost implications which they see as necessary to achieve their internal objectives. Phil pointed out some of the key elements to consider, such as ‘Exposure’, ‘Agility’ and ‘Culture’. Not surprisingly there was a good deal of discussion, which was only stopped due to time constraints. We then moved on to our regular ‘Sharing your current In-tray’ session in which participants introduced themselves and highlighted any key issues and concerns that were at the top of their In-tray. One of our most senior Members posed a question concerning how professional we are as Security Executives and what training and qualifications should be needed to be a Corporate Security Executive at a major corporation. It would appear that many corporate security executives learn ‘on the job’ and either have a military or security services background. The security function is also in danger of existing in a silo, as it is seen as separate from most other corporate functions. It is unusual for a head of Security to transition to the Board in the way that the heads of other functions often do. This is going to be a subject to be discussed again at future meetings. The meeting then transferred to The Tower of London. As is traditional, Crispin or Michael suggests a cocktail. In a strange attempt to avoid us drinking BBQ sauce and bourbon (what? ), Crispin decided that the weather called for champagne. What did he have in his crazed cocktail mind? We may find out in future. Following the drink at The Fusiliers Museum, and listening to shouts far beyond the Tower as the England-Croatia match ebbed and flowed, we had a lovely summer dinner. Our dinner speaker was Diana Darke, who has travelled extensively in the Middle East and spent over twenty years working in the intelligence and counter intelligence world. She is a fluent Arabic speaker and has restored a magnificent home in the World Heritage area of Damascus. Diana discussed her latest book, ‘The Merchant of Syria: A History Of Survival’, and a signed copy was given to all those present. The discussion was wide-ranging, but focused on past, present, and future mistakes, as well as the enduring importance and over-riding endurance of trust in all commercial relationships, especially those in war zones. Our autumn meeting will take place on 10 October 2018. One of the reasons we named our commercial think-tank Z/Yen was to appeal to those who had more imagination than simply to go to the top of a directory list and shell out for Arthur Aardvark. But it does also mean that Z/Yen tends to appear last on a list of thanks. One such example is the July 2018 City Of London Corporation publication, The Commonwealth Connection: Growing Trade In Services. Our very own Michael Mainelli was one of the interviewees for this study. Only Now & Z/Yen's modesty and good manners prevents us from typing verbatim the glowing note of thanks Michael received from the City of London Corporation Research Department for his time and insights. The report is a thumping good read; we recommend it wholeheartedly, especially to those interested in global trade in services. Here is a link again - this time straight into the pdf of the report. The perceptive reader might spot Z/Yen's mention at the very end of the list of thanks. The even more perceptive reader might also spot The Worshipful Company Of World Traders as the anti-penultimate entry on that list. As Michael Mainelli is the Master of that august body, Now & Z/Yen would like to know whether Michael gave two interviews to generate two thank you listings - we think we should be told. Joking apart, Z/Yen is delighted to have been able to help with this important and interesting study. Long Finance's Distributed Futures research programme launched its latest report at a reception at the Houses of Parliament recently, and then in more detail at The Furniture Makers Hall. The report, entitled, “The Economic Impact Of Smart Ledgers On World Trade”, was the latest in a series of exciting projects in the programme. The launch events were attended by over 200 people, including members of parliament, commonwealth delegates, cryptocurrency issuers and followers, technologists, bankers, economists, regulators, trade organisations, lawyers and well, just about anyone that’s anyone. And they weren’t there, smartly dressed, just for the canapes, historical tour and distinguished speakers. They wanted to see if those smart people at Z/Yen and Cebr (The Centre for Economics and Business Research) had come up with some interesting findings. And this is just goods, imagine what the predictions would be for services. Well, we have Smart Phones, Smart Cards, Smart Cars, Smart Criteria, Smart Homes, S.M.A.R.T. goal setting (don’t ask) and so on. In fact, just about anything that uses electricity now comes with a ‘Smart’ prefix. And now we have Smart Ledgers, also known as mutual distributed ledgers (MDLs), the technology that, among other things, underpins the blockchain technology, that among other things, underpins cryptocurrencies. Did you know there are over 1,500 of those now by the way? So, what are Smart Ledgers, and how do you get to understand more about their impact and the opportunities that are out there? Smart Ledgers are based on a combination of mutual distributed ledgers (multi-organisational databases with a super audit trail) with embedded programming and sensing, thus permitting semi-intelligent, autonomous transactions. Smart Ledgers are touted as a technology for fair play in a globalised world. There are numerous projects building trade systems using this technology with announcements from governments, shipping firms, large IT firms, and the like. Michael Mainelli, Executive Chairman of the Z/Yen Group wrote in his Preface to the report: "Trade reaps economic benefits from specialisation and comparative advantage, creates prosperity, distributes success and wealth, and collectively enriches all of our societies and communities. Hopefully, knowing the scale of relative benefits can help speed adoption of some boring technology – ‘multi-organisational databases with a super audit trail’ - for the benefit of all of us". 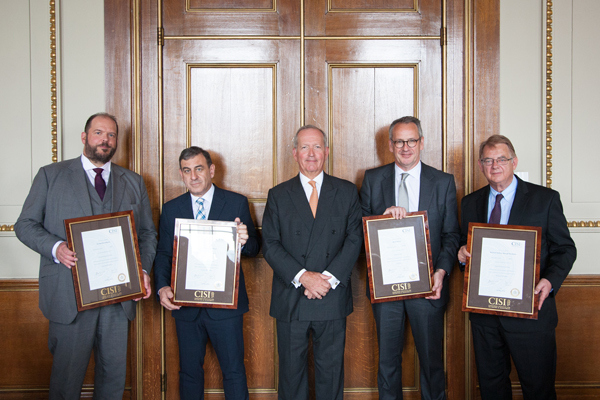 Now & Z/Yen is delighted to announce that our very own Alderman Professor Michael Mainelli was recently one of five City dignitaries to be awarded a Chartered Institute of Services And Investment (CISI) Honorary Fellowship. ...and by Mondovisione - click here. But wait...where are the five dignitaries? That photograph, depicts only four honorary fellows plus Sir Alan Yarrow, handing out the gongs. Michael Mainelli is not amongst them. What's going on? "was at Buckingham Palace Garden Party"
"...the Queen has one of me on her mantelpiece now, whereas those City guys don’t." "might a Now & Z/Yen piece on this topic seem like bragging?" Not at all, Michael - up she goes. Many congratulations on the honour. The Rule Of Three, All For One And Who Ya Gonna Call?